My budgie birds like to come out of their cage and fly around. The blue one is very laid back. They are very good pets except a bit too noisy. It is very fun to watch them, they are very entertaining. Thanks for the great photo. They are so cute together. I am pretty sure it was a very special seed when he decided to "fight" for it. When it comes to budgies, it is so great to watch them play like this. i love my parakeets Birdzilla % Bella.i love watching them play.my parakeets share seeds all the time.its wierdBirdzilla its almost like he feeds her!i have only seen her eat out of her food bowl 1 time. i love parakeets!!!!!!! 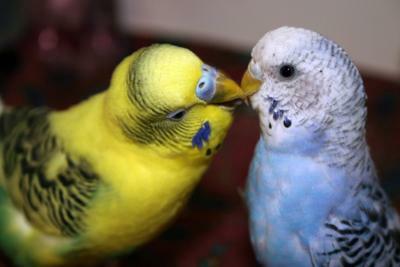 I have a blue and a yellow budgie. Of the two the yellow one is much more laid back and will let people hold her but, the blue one doesn't like to be touched. Thanks for telling us about your birds they look really cool.